Established in 1939, D. Geller & Son Jewelers of Atlanta is one of the oldest fine jewelry and diamond companies in the south. Amazingly, the Geller family represents 14 generations and over 1,100 years in the jewelry industry. Being an independent jeweler, D. Geller & Son offers a unique opportunity for their customer to receive personalized service and the best value on their purchase. At D. Geller & Son the fine halo engagement ring has become the desire for brides-to-be. The halo design enhances the brilliance of the diamond center stone for maximum sparkle. At Coast Diamond we take great care in the design of our halo engagement rings and offer various ways to customize a ring just for her. Stop into D. Geller & Son today and choose one of these stunning Coast Diamond halo engagement rings to personalize for your bride-to-be! Oval Halo Coast Diamond engagement ring (LC5410-OV) with fine diamonds sparkling down the shoulders for the trendsetting bride. Scallop Halo Coast Diamond 2 CT engagement ring (LC10072-200) with three rows of fish tail and prong set diamonds for the glamorous bride. Princess Cut Halo Coast Diamond engagement ring (LC5410-PC) for the modern bride. Congratulations to D. Geller & Son for their long standing history of above and beyond service to their customer and for being our Coast Diamond Featured Retailer of the Week! Diamonds have been a family tradition for the Droste family since 1967. Droste’s Jewelry Shoppes began with Ottie and Barbara Droste serving over 65 retail jewelry stores in the Tri-state area (Indiana, Illinois and Northern Kentucky) in quality jewelry repair and custom jewelry design. The Droste’s reputation for outstanding craftsmanship and quality service grew so quickly they opened their first store in Evansville just one year later (1968). The Droste family photo from 1966. Today, the Droste’s rich Bavarian heritage in the jewelry business thrives as their sons, Gregory and Timothy, continue to bring Old World Craftsmanship and New World Design to every customer who walks through their doors. They love educating their customers on the Seven Cs of Diamond Quality: Carat weight, Color, Cut, Clarity, Credentials, Certification and Comparative price. At Droste’s you can have confidence you have chosen the perfect diamond center stone for your engagement ring. Choose the perfect Coast Diamond engagement ring and complete it with a brilliant Droste’s ‘Love’s Light’ Diamond center stone. The Droste’s ‘Love’s Light’ Diamonds are carefully hand selected, very high cut quality diamonds from the world’s best diamond cutters. Droste’s is able to offer them to their customers at much less cost than the nationally advertised branded diamonds. Picking a Droste’s ‘Love’s Light’ Diamond under the ‘Love’s Light’ viewing scope is a memorable and exciting event in itself! 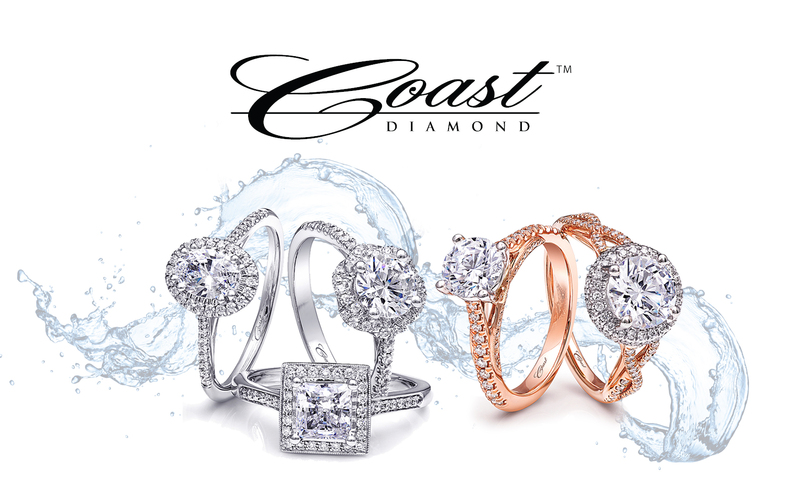 Which of these Coast Diamond engagement rings will you customize with a Droste’s ‘Love’s Light’ Diamond? The Popular Coast Diamond halo engagement ring (LC5257-050) with pave set diamonds on the shoulders that lead up to a sparkling halo that surrounds a 0.50 CT diamond center stone. The Timeless Coast Diamond six prong engagement ring (LC5270) with 0.31 CT of round diamonds on the shoulders and paired with a diamond wedding band (WC5270) that sits flush. The Intricate floral Coast Diamond halo engagement ring (LC6026) with milgrain edging and fish tail set diamonds on the split shank. Congratulations Droste’s Jewelry Shoppes of Evansville, IN for being our Coast Diamond Featured Retailer of the Week! When shopping for an engagement ring at Simmons Fine Jewelry, you will be introduced to the exciting process of picking the perfect engagement ring setting. Then, your setting will need the perfect diamond center stone, or maybe you want the trending colored gemstone as the centerpiece of your engagement ring. Simmons loves to help you create the perfect ring for for such an extraordinary occasion as your marriage proposal. You can see how Simmons personalized a Coast Diamond engagement ring with a dazzling Hearts On Fire diamond center stone by viewing the video below. Aren’t you excited to get to Simmons Fine Jewelry and start creating the perfect Coast Diamond engagement ring for your loved one? There are so many to designs to choose from and you can start your shopping on the Coast Diamond website, where you will find them all. Here is a peek at some of the Coast engagement rings that are trending today. Click the image for further details from the Coast Diamond website. Classic Coast Diamond engagement ring (LC5250) with a 1 CT center diamond in a six prong setting. Graceful round diamonds cascade down the shoulders. Award-Winning Design is found in this Coast Diamond petite cushion-shaped halo wedding set (LC5410-WC5410). Perfect for a 1 CT center diamond. Show-Stopping 3 CT Coast Diamond engagement ring (LS10143) with a sumptuous diamond halo and three rows of diamonds on the shank. Congratulations Simmons Fine Jewelry of Boise, ID for being selected Coast Diamond’s Featured Retailer of the Week! Coast Diamond is pleased to select Continental Diamonds, Inc. of Atlanta, Ga as our featured retailer of the week. “Diamonds are like fingerprints – each one is unique” and for over 35 years Continental Diamonds, Inc. has been serving customers in the Atlanta, Ga area with a desire to guide each customer in finding the perfect diamond. The diamond center stone is the element of an engagement ring that makes it personal – Makes it “YOU.” Harry Warneke became Gemological Institute of America (GIA) trained and opened the doors of Continental Diamonds, Inc. in 1978, with the passion to share his knowledge of diamonds with his customers and create an experience that would make them come back for years to come. Your experience with a jeweler should not be a one-time experience… Return for a cleaning… Return for sizing… Return for an upgrade in your diamond for an anniversary. Continental Diamonds, Inc has 35 years of commitment to customer satisfaction, value and selection, so you will return to them for all your diamond jewelry needs. Classic Coast Diamond white gold wedding set (LC5250-WC5250) with a six prong diamond center stone setting and fishtail-set diamonds on the band. Brilliant Coast Diamond 1 CT round engagement ring (LC5448) with a halo that adds sparkle for miles. Glamorous Coast Diamond halo engagement ring (LZ5015) surrounded by round diamonds in a spacious setting that catches the light. Click here to contact Continental Diamonds, Inc.
Congratulations Continental Diamonds, Inc. of Atlanta for being selected the Coast Diamond Featured Retailer of the Week!